Recently retired from over fifty years of service to God and to the people of the Archdiocese of Los Angeles, Monsignor Weber has allowed us to publish some of the delightful, insightful, and very succinct homilies he has given on real and literary characters found in the holy gospels. The four gospels tell us the story of Jesus Christ, Son of God and Son of Man, the Savior of the world. In the course of those gospels, Jesus Christ tells us many stories that reveal God the Father’s loving plan for our salvation. Through the homilies collected here Monsignor Francis Weber does what a good preacher always does, that is, he points out the spiritual truth the gospels reveal, and then connects that truth with our own faith and daily experiences as disciples of Jesus Christ. By “real characters” Monsignor Weber indicates the real life men and women whom Jesus met and engaged during his life and ministry, such as Peter and Paul and Pontius Pilate. “Literary characters” are the imaginary figures in Christ’s parables, such as the Prodigal Son and the Good Samaritan. The four Gospels tell us the story of Jesus Christ, Son of God and Son of Man, the Savior of the world. In the course of those Gospels Jesus Christ tells us many stories that reveal God the Father’s loving plan for our salvation. Through the homilies collected here, Monsignor Francis Weber does what a good preacher always does, that is, he points out the spiritual truth the Gospels reveal, and then connects that truth with our own faith and daily experiences as disciples of Jesus Christ. By “real characters” Monsignor Weber indicates the real life men and women whom Jesus met and engaged during his life and ministry, such as Sts. Peter and Paul, and Pontius Pilate. 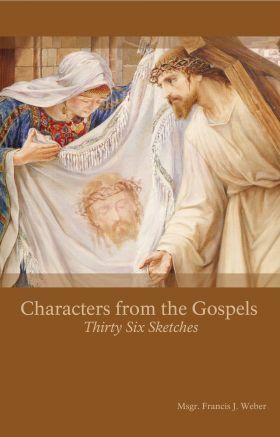 “Literary characters” are the imaginary figures in Christ’s parables, such as the Prodigal Son and the Good Samaritan. Mary, the Mother of Jesus, is the most significant among the real characters, because of her call to give birth to the Savior and to share in his life, and death, and resurrection in such a profound and unique way that she truly experienced martyrdom on Calvary and now reigns as Queen of Heaven. Our author shows us that Sts. Peter and Paul are sinful men who encounter Jesus Christ, are transformed by the experience, and especially by His forgiving love. Very different from one another in personality, they build the early Church by their faith and their apostolic ministry. Zacchaeus, the Jericho tax collector in Luke’s Gospel who climbs a sycamore tree to get a better view of Jesus, becomes for Monsignor Weber the patron of all of those who are called to “go out on a limb” because of their faith in Jesus who has changed their lives so much. While the Prodigal Son is “imaginary” in the parable, he is quite real for all of us sinful Christians who hear Jesus teach in this story that God our Father does not ignore sin; instead, he overcomes it with forgiving love. The beggar, Lazarus, is the only figure in the parables of Jesus who is given a name, and the rich man in his story shows us that having riches is not a sin, but ignoring the sufferings of others when we could help to relieve them is a damning offense. Interestingly, another aspect of riches and their use is involved in the story of one of the real characters, the Young Man that Jesus Loved, whom the Lord called to follow him as a disciple. The young man turned away sadly because he would not let go of his possessions.